Deanta are a leading provider with a wide selection of internal doors and fire doors offering experienced door designs for adding to the home. With more than 20 years within the business, Deanta produces high-quality doors with the finest materials. 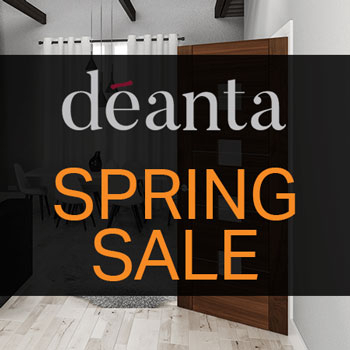 Deanta’s internal doors are available at Trading Depot, with options specific to any home design transforming and committing to the door industry. With the addition of solid oak doors in a variety of styles, whether looking for a specific finish or adding a fire door. For an additional 5% off orders over £300 please enter code DEANTA5 at the checkout. Add a stylish design to your home's interior with a wide collection of different materials along with a selection of fire doors. Whether you are looking at adding an oak, walnut or white primed door, Deanta’s range is perfect complements for your home. Deanta’s range of doors includes high-quality fire doors perfect for providing safety whilst also adding style to the home, blending your design with décor. Deanta doors are constructed with the finest materials, ensuring high-quality performance bringing a stand out design to the home. With a wide range of sizes available, Deanta’s door range is ideal for adding to any home bringing the perfect door to fit your design. Trading Depot’s variety of Deanta doors bring sophistication to your design with high-quality oak, walnut and white primed doors with an additional option of fire safety features. Bringing a sophisticated design to the style of the home is a simple solution, with a wide variety of options available. 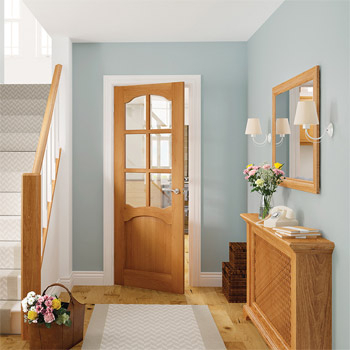 Whether looking at adding white painted doors, walnut internal doors or oak interior doors to the home, you can find the perfect addition through Trading Depot. Along with the extra option of fire doors, Deanta have the ideal design to bring class into your room whatever choice you are looking at adding specifically to the personality of your home. Deanta’s range of doors is beautifully crafted interior doors, whether you have a specific style or door type in mind. You can find the perfect addition for your home with a natural classical feel being added to your room. Adding Deanta to the home creates a prominent feature giving your room a standout design at the perfect style.